La Vencedora(#6) and Cappy(#5) battle to the top two qualifying time in the Governors' Stakes trials at Indiana Grand. SHELBYVILLE, IN-OCTOBER 7, 2017-Quarter Horse Trainer Larry Sharp made his trip to Indiana worthwhile Saturday picking up the top three spots for qualifiers advancing to the ninth running of the $100,000 Governor's Stake slated for Saturday, October 21. Sharp saddled La Vencedora and Jockey James Flores to a neck win over his other entrant, Cappy, ridden by Shanley Jackson, and then BS Special, also ridden by Flores, in the other trial for a very solid one-two-three punch heading into the final. La Vencedora and Cappy were the first two out of the gate, starting side by side and battling for the lead throughout the 350-yard dash. It took the majority of the stretch for La Vencedora to overtake her stablemate, inching forward late to win by a neck over Cappy in a time of :17.837 seconds. The top two were open lengths in front of the rest of the field that was headed up by Racanteur and Rolando Pina for third. La Vencedora came into the race with only one defeat in four outings. 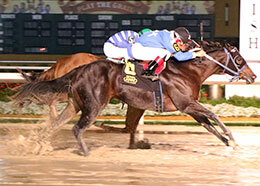 The freshman filly by IVORY JAMES is now four for five and on a four-race win streak for owner Jon and Brant Barley. La Vencedora is inching closer to $400,000 in career earnings for her connections. She is out of the Mr Jess Perry mare Jess Shakem. Bobby D. Cox is the breeder. For the top 10 qualifiers to the Governors Stakes, with times, sires, dams, owners, breeders, trainers and jockeys CLICK HERE. In the the $100,000 QHRAI Derby trials later in the Indiana Grand card Tuxedau, a son of IVORY JAMES, posted the third fastest time of :19.976 seconds. Richardo Martinez saddled the gelding for owner Claudio Barraza. Bobby D. Cox bred Tuxedau in Oklahoma from the First To Shine mare Shiney Copy. For the top 10 qualifiers to the QHRAI Derby, with times, sires, dams, owners, breeders, trainers and jockeys CLICK HERE. The Governor�s Stake and the QHRAI Derby will be two of five stakes races on the program Saturday, Oct. 21, which is the final all-Quarter Horse racing night of 2017 at Indiana Grand.